[polldaddy poll=8620663]So, it has come to my attention that a lot of people don't know about certain Chocolate Bars and Sweets that have been discontinued over the years. Maybe we are in denial that our FAVORITE Chocolate bar is no longer being produced? I have been doing a little bit of research and below is a list of just a few of our favorite Chocolate Bars that are no longer being produced. Top of the list has to be the famous Pollywaffle. This Chocolate bar was made by Nestle and was the last production was on the 23rd of November 2009. Such a yummy Chocolate bar, I remember it well. For those that weren't lucky enough to try one; a waffle wafer tube filled with marshmallow covered in milk chocolate. My mind keeps telling me that their was a Polly Waffle Ice Cream too! No one believes me and I cannot find any evidence to prove that their was a Pollywaffle Ice Cream, if you remember this too comment below. So, Nestle changed the recipe early 2009 and the reason they stopped production was because of poor sales, could it have been due to the recipe change? I couldn't find too much information on the Wonka Bar but I know alot of people still beleive it is being produced. That is, the original Wonka Bar that was produced. It was discontinued in 2010 once again to poor sales. This Chocolate bar was also made by Nestle. Do you remember the Wonka Bar? 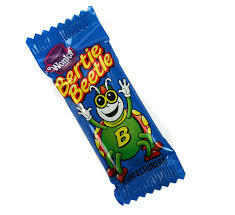 Ahh the Bertie Beetle, such a great little Chocolate. The Wonka Candy Company is owned and licensed by Nestle. Bertie Beetles were first produced in 1963 and were sold in shops until 1970. Nestle made an exclusive agreement to showbags marketing that Bertie Beetles would only be sold at Shows and Exhibitions in showbags. So, do we notice a little pattern here? Most of the yummy treats that have been discontinued are all made by Nestle, I wonder why? What are your thoughts? 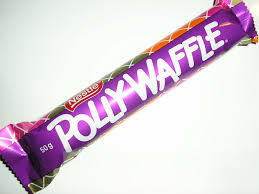 Pollywaffle ice creams were my absolute favourite. They were basically chocolate wedge ice creams with marshmallow ice cream filling instead. It saddens me that no one remembers them or how amazing they were. Bertie Beetles! They are the best! I still buy show bags to get my hands on these! And I definitely remember the Milo bar- my dad used to work for Nestle, so we got Milo by the kilo. Nestle are definitely not the smartest tools in the shed, they seem to make a lot of bad decisions. do you know where i can buy bertie beetles? Do you stock pollywaffles to sell or currently produce these famous items?